Itna sanjeeda chehra bana ker match dekh rhe hotay hain jaise tajziyanigar hon. Camera unki taraf hua aur aai tawwaif bahar! Its good to see azhar mahmood in islamabad united. So at the halfway point, @KarachiKingsARY are 53/3 and it feels like they're only there because of some canny bowling, not the pitch. Coming up next is someone who's already a legend at this, and many other venues. @AzharMahmood11 is coming in for his first ball of #HBLPSL .
.@ravibopara has no such troubles, driving a full ball towards that gap for four. 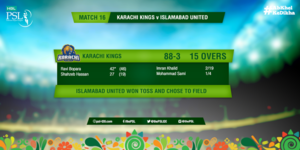 @KarachiKingsARY still way behind a par score. The only person having fun in this game is the commentator ???? I have an exam tomorrow but here i am watching #IUvKK and tweeting. @thePSLt20 is crazy. Loved it. For the past couple of days, have seen Umpiring Standard in #PSLT20 go miserably down.